With a program packed full with interactive performances and workshops spanning theatre, dance, music, magic, circus and craft to inspire and encourage children to get up and moving, it’s no wonder that the Roola Boola Children’s Art Festival is one of Melbourne’s most loved, annual school holiday events. As part of the festival, we attended the exciting new children’s ballet, “Once Upon A Time”, performed by artists of Melbourne City Ballet and choreographed by Brendan Bradshaw. This 45 minute production - suitable for little ones 3 years and over - followed the beautiful Little Red Riding Hood as she set out on an adventure through the forest to her grandmother's house. With a basket of homemade chocolate chip cookies (that she baked with the help of the Three Blind Mice), Little Red Riding Hood met plenty of new friends on her journey, including the Three Little Pigs and Little Bo Peep and with her new friends' help escaped the Big Bad Wolf. The poppets absolutely loved this performance; giggling at the clumsy Three Blind Mice, pointing out the curly, pink tails on the bottoms of the Three Little Pigs and dancing along to the beautiful accompanying soundtrack. Meeting the cast after the show was certainly an added bonus too. Master Arlo even tried to steal a cookie from the basket! 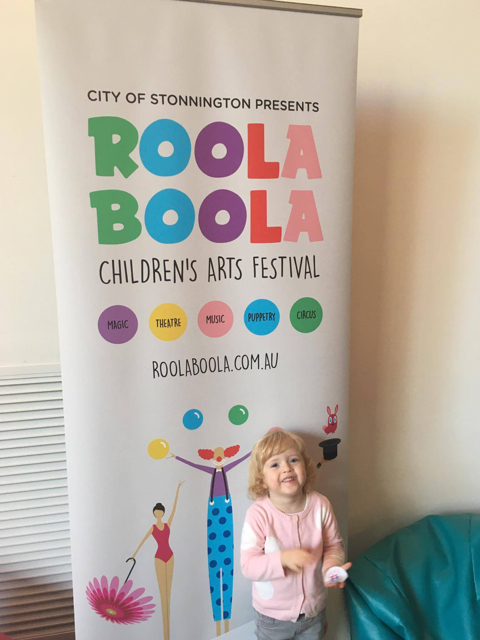 The Roola Boola Children’s Art Festival is on now until Friday 14th July and with fantastic free and ticketed events happening daily, it is guaranteed to put a smile on your dial! Head to their website for more details.